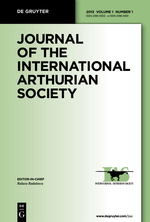 The International Arthurian Society (IAS) was formed in 1948 and brings together scholars interested in Arthuriana from all over the world. From 1949-2011 the Society published an annual bibliography and research articles in the annual Bibliographical Bulletin of the Arthurian Society/ Bulletin Bibliographique de la Société Internationale Arthurienne (BBIAS / BBSIA). The last combined volume of the bibliography and research articles was in 2011, and they are now separated into the two new publications below, JIAS and BIAS, both available online. The IAS welcomes new members. If you are a scholar working on Arthuriana, please click through to find out more. The programme is now available for this conference. The Minutes of the General Assembly of the XXVth Congress of the International Arthurian Society which took place in Würzburg, Germany are now available.